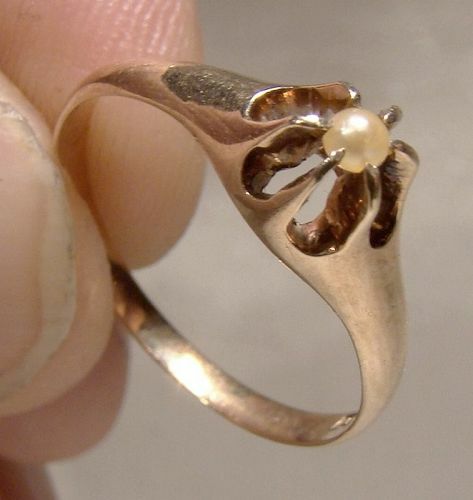 A 10k rose gold Edwardian or late Victorian solitaire pearl ring circa 1900. This size 5-1/2 ring features a high claw-set 2.5 mm. pearl in a 3/16" across setting. The ring is stamped 10K with a maker's mark, it weighs 1.5 grams and it is in excellent condition with no chips, cracks, dents, bends, corrosion, damage or repairs. All items are thoroughly and conservatively graded and all condition issues are noted; all items are vintage or antique and may have slight signs of gentle use. Tracked Packet shipping to anywhere in the U.S. is $14.00 - this includes online tracking, air service and insurance up to $70. Items paid with a credit card will be shipped to confirmed addresses only. We do ship internationally. All of our prices are in $US. PLEASE NOTE: We DO NOT accept PayPal. 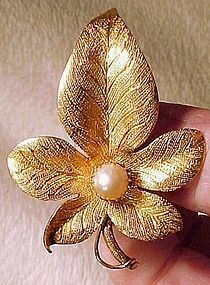 An Edwardian or Late Victorian 15k yellow gold 4 leaf clover brooch pin circa 1900. This pin has no gold stamp (and it tests as 15k). Measuring 1-3/8 x 9/16", it features a four leaf clover, it has a c-clasp and it weighs 2.7 grams. It has a star maker's mark and it is in excellent condition with no dents, bends, corrosion, damage or repairs. All items are thoroughly and conservatively graded and all condition issues are noted; all items are vintage or antique and may have slight signs of gentle use. Expedited tracked and insured parcel shipping to the U.S. starts at $20 (other spots may vary, air is higher). Items paid with a credit card will be shipped to confirmed addresses only. We do ship internationally. All of our prices are in $US. PLEASE NOTE: We DO NOT accept PayPal. A 10k Victorian 19th century chain necklace. This attractive 16-7/8" chain consists of 1/8" wide double links and it has later gold filled ends (a swivel and a springring). It was cut down from a long Victorian fan chain and it would make a nice bracelet or necklace. It weighs 9.1 grams (including the gold filled terminals), it is unsigned, it tests as 10k gold and it is in excellent condition with no dents, bends, corrosion, damage or repairs. All items are thoroughly and conservatively graded and all condition issues are noted; all items are vintage or antique and may have slight signs of gentle use. Expedited tracked and insured parcel shipping to the U.S. starts at $23 (other spots may vary, air is higher). Items paid with a credit card will be shipped to confirmed addresses only. We do ship internationally. All of our prices are in $US. PLEASE NOTE: We DO NOT accept PayPal. A 19thC 15k garnet pearls stickpin cravat or tie pin in a case. 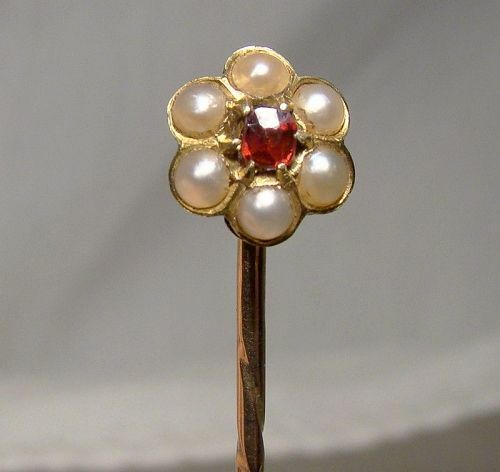 This 2-3/8" pin has a flower style 3/8" head with a deep ruby red garnet surrounded by pearls. It is unmarked but tests as 15k and the gold is slightly rose in colour. The pin is Victorian in style with the twisted shaft inserted into a ring on the head however the fitted hinged case has the Goldsmiths & Silversmiths Company Ltd. mark used after 1898 with the Appointment to the King legend which would make it Edwardian. It's possible the pin is older than the case but it could also be contemporary to it (c1901) even though it has an older Victorian manufacturing style. We obtained them together and that's how we're selling them. The case is velvet and silk lined with a gold maker's stamp. This lovely pin is in excellent condition with no chips, cracks, dents, bends, corrosion, damage or repairs other than some minor rubs to the black leather wrapped gold trimmed case. It can be re-blacked with shoe polish if you want. All items are thoroughly and conservatively graded and all condition issues are noted; all items are vintage or antique and may have slight signs of gentle use. Expedited tracked and insured parcel shipping to the U.S. starts at $20 (other spots may vary, air is higher). Items paid with a credit card will be shipped to confirmed addresses only. We do ship internationally. All of our prices are in $US. PLEASE NOTE: We DO NOT accept PayPal. 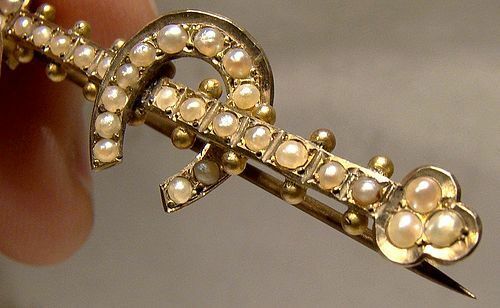 A Victorian 1-3/4" 9k yellow gold horseshoe good luck pin or brooch with seed pearls dated 1886. This fine pin has a c-clasp, it weighs 1.9 grams, it is hallmarked (partially obscured), it tests as 9 carat gold and it is in excellent condition with no chips, cracks, dents, bends, corrosion, losses, damage or repairs. All items are thoroughly and conservatively graded and all condition issues are noted; all items are vintage or antique and may have slight signs of gentle use. Expedited tracked and insured parcel shipping to the U.S. starts at $22 (other spots may vary, air is higher). Items paid with a credit card will be shipped to confirmed addresses only. We do ship internationally. All of our prices are in $US. PLEASE NOTE: We DO NOT accept PayPal. 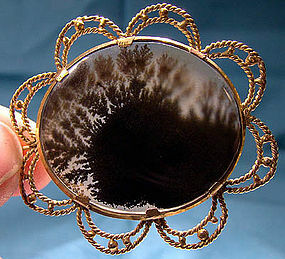 A stylish antique Victorian period large Neoclassical style hair / mourning brooch c1860-70. This 2" x 1-1/2" pin features the multilayered effect found in Victorian high-style jewellery, and it has great gold appliques and fine ropework. It features two braids of blonde and brown hair under the original glass, which retains its original bezel. One plait is small and chestnut brown and tied with a pink ribbon, the other larger one is blonde with grey. The mounting and presentation is quite fine, and this unmarked pin tests as 14K yellow gold; it weighs 13.3 grams. It has a c-clasp, and it is in mostly excellent condition with no dents, monograms, corrosion, repairs or damage other than the loss of one decorative "S" applique (this is restoreable by a competent jeweller or jewellery repairer). All items are thoroughly and conservatively graded and all condition issues are noted; all items are vintage or antique and may have slight signs of gentle use. Expedited tracked and insured parcel shipping to the U.S. starts at $26 (other spots may vary, air is higher). Items paid with a credit card will be shipped to confirmed addresses only. We do ship internationally. All of our prices are in $US. PLEASE NOTE: We DO NOT accept PayPal. 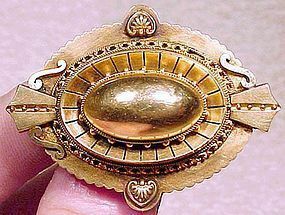 A large splendid mid-19th century 14K hand made brooch with a central large claw-set genuine pearl. This 2-3/8" x 1-3/4" brooch has very finely hand engraved and stippled leaves with superb detail with a fine 7.2 mm pearl in the center. The pin is a c-clasp and the pearl setting is mounted with a hand cut nut and bolt; the pin weighs an impressive 14.4 grams (1/2 ounce) of 14k gold; it is not marked but has been tested and is guaranteed to be 14K. This beauty is in excellent condition with no chips, cracks, losses, corrosion, repairs or damage. Expedited tracked and insured parcel shipping to the U.S. starts at $32 (other spots may vary, air is higher) - tracking and insurance is included in shipping quotes. Items paid with a credit card will be shipped to confirmed addresses only. We do ship internationally. All of our prices are in $US. PLEASE NOTE: We DO NOT accept PayPal, only VISA and MASTERCARD. 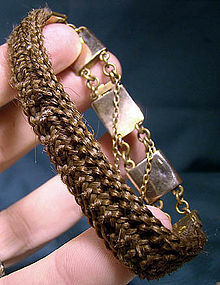 A 9k Victorian hair bracelet from 1860-70. This mid-Victorian 8-3/4 x 1/2" woven hair bracelet with 9k (unmarked but tested) yellow gold mounts has a safety chain and a box clasp; the gold mounts are connected with gold-filled round loops. This bracelet has a monogram, it weighs 9.2 grams in total, and it is in excellent condition with no bends, corrosion, losses, damage or repairs other than a small dent on the underside. All items are thoroughly and conservatively graded and all condition issues are noted; all items are vintage or antique and may have slight signs of gentle use. Expedited tracked and insured parcel shipping to the U.S. starts at $22 (other spots may vary, air is higher). Items paid with a credit card will be shipped to confirmed addresses only. We do ship internationally. All of our prices are in $US. PLEASE NOTE: We DO NOT accept PayPal. A vintage Victorian 1-7/8 x 1-3/4" moss or scenic agate pin mounted in (unmarked but tested) 12k yellow gold. This unsigned pin has a c-clasp, it weighs 10.2 grams, and it is in excellent condition with no chips, cracks, dents, bends, corrosion, losses, damage or repairs. All items are thoroughly and conservatively graded and all condition issues are noted; all items are vintage or antique and may have slight signs of gentle use. Surface tracked shipping to the U.S. starts at $18 (other spots may vary) - insured is higher, and mandatory on items over $95 if paid with a credit card. Items paid with a credit card will be shipped to confirmed addresses only. We do ship internationally. All of our prices are in $US. NOTE: we DO NOT accept PayPal, only VISA and MASTERCARD. A vintage late Victorian/early Edwardian period gentleman's 10k yellow gold ring (just a faint tinge of rose gold tone), featuring a bevelled genuine sardonyx claw-set stone. 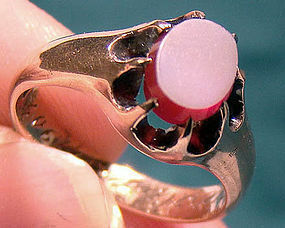 This size 6 ring measures 3/8" across the stone, it weighs 4.0 grams, and it is stamped 10K and A.C.K. CO. It has BESSIE AUG. 20/1902 inscribed on the interior of the shank. The claws quite unusually end before the surface of the ring so not to impede the look of the stone - possibly this is why the stone has such unusual bevelling. 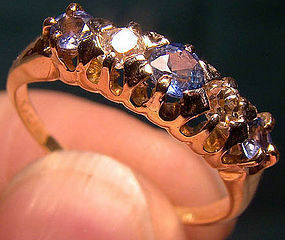 This ring is in excellent vintage condition with no chips, cracks, dents, bends, corrosion, losses, damage or repairs. All items are thoroughly and conservatively graded and all condition issues are noted; all items are vintage or antique and may have slight signs of gentle use. Surface tracked shipping to the U.S. starts at $19 (other spots may vary) - insurance/tracking is included in shipping quotes. Items paid with a credit card will be shipped to confirmed addresses only. We do ship internationally. All of our prices are in $US. PLEASE NOTE: we DO NOT accept PayPal, only VISA and MASTERCARD. A pair of 14k pearls Victorian earrings from 1880-90. 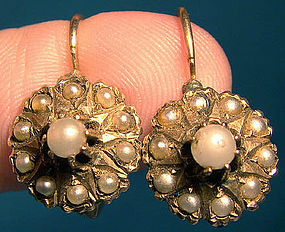 This vintage pair of late Victorian pearl earrings is in 14k (unmarked but tested) yellow gold. These 1/2" across earrings have tab-and-slot hinged pierced closures, the surrounding half pearls average 2mm. each and the central claw-set half pearls are 3 and 4mm. across. These unsigned beauties weigh 3.1 grams, and they are is in excellent condition with no chips, cracks, dents, bends, corrosion, losses, damage or repairs. All items are thoroughly and conservatively graded and all condition issues are noted; all items are vintage or antique and may have slight signs of gentle use. Expedited tracked and insured parcel shipping to the U.S. starts at $28 (other spots may vary, air is higher). Items paid with a credit card will be shipped to confirmed addresses only. We do ship internationally. All of our prices are in $US. PLEASE NOTE: We DO NOT accept PayPal. An 18k diamonds and cornflower sapphires row ring circa 1890. 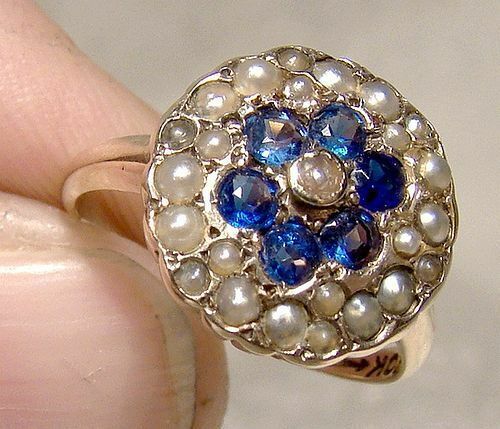 This Victorian period size 6 ring is 18k yellow gold, with genuine natural sapphires and antique sut diamonds. It measures 3/4" x 3/16" across the setting, the two diamonds measure approximately 10 points each by gauge, and the cornflower blue sapphires measure approximately 6 points each (side) and 12 points (central). This ring weighs 2.0 grams, it is stamped 18CT with a CT maker's mark. It is in excellent condition with no chips, cracks, dents, bends, corrosion, losses, damage or repairs. All items are thoroughly and conservatively graded and all condition issues are noted; all items are vintage or antique and may have slight signs of gentle use as would be expected. Silver and silver plated items are hand-polished, not buffed, and our halogens and magnified images may exaggerate otherwise barely noticeable scratches and flaws. Expedited insured tracked parcel shipping to the U.S. starts at $31 and expedited shipping within Canada starts at $21. Rates vary by destination, value, size, weight, payment option and shipping method. Other payment, tracking and insurance options are available - please inquire. We ship worldwide - please contact us for an accurate shipping quote with your postal code or country. **** PLEASE NOTE: We DO NOT ACCEPT PAYPAL**** PAYMENT: We accept VISA and MASTERCARD directly (processed through our own store credit card processor to confirmed and confirmable addresses. Canadian buyers can also pay by Interac e-transfer. Rates can vary by distance. We are happy to ship items together to save on shipping whenever possible, and if our rate remains the same, so does yours. We pack well. Items paid with a credit card will be shipped to confirmed addresses only. All of our prices are in $US. Copyright Fiona Kenny and www.fionakennyantiques.com. Unauthorized use and/or duplication of any part of this material without express and written permission from this site’s author and/or shop owner is strictly prohibited. 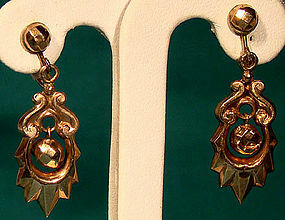 A pair of Victorian 12k rose gold drop earrings circa 1900. These (unmarked but tested) 12k rose gold drop earrings are mounted on later gold filled screwback mounts. These earrings measure 1-1/2 x 1/2" and they are of hollow construction. They dangle freely and the facetted balls move as well. A half-ball is mounted on each 12k gold filled back, and this pair weighs 2.4 grams. They are in very good condition with no bends, corrosion, losses, damage or repairs other than a bit of flattening to one ball and some crushing to the other. All items are thoroughly and conservatively graded and all condition issues are noted; all items are vintage or antique and may have slight signs of gentle use. Expedited tracked and insured parcel shipping to the U.S. starts at $20 (other spots may vary, air is higher). Items paid with a credit card will be shipped to confirmed addresses only. We do ship internationally. All of our prices are in $US. PLEASE NOTE: We DO NOT accept PayPal. 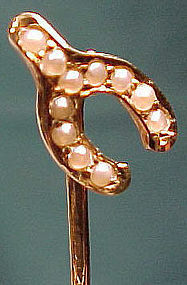 A vintage late-Victorian 2-3/8" stickpin in the form of a wishbone. This c1900 pin features 11 seed pearls; it measures 3/8 x 7/16" across the top and it weighs 1.4 grams. It is stamped 14K with a key maker's mark, and it is in excellent condition with no chips, cracks, dents, bends, corrosion, losses, damage or repairs. All items are thoroughly and conservatively graded and all condition issues are noted; all items are vintage or antique and may have slight signs of gentle use. Surface shipping to the U.S. starts at $6.30 (other spots may vary) - insured is higher, and mandatory on items over $95 if paid with a credit card. Items paid with a credit card will be shipped to confirmed addresses only. We do ship internationally. All of our prices are in $US. NOTE: we DO NOT accept PayPal. 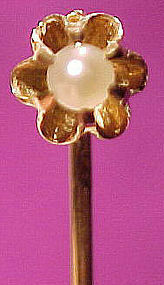 A 14k pearl Victorian stickpin circa 1890-1900. This antique stick pin is 2-1/2" in length and features a fancy claw-set 3mm genuine pearl with a silvery lustre. It measures 1/4" across the claws and pearl and it weighs 1.0 grams. It is stamped 14 K, and it is in excellent condition with no chips, cracks, dents, bends, corrosion, losses, damage or repairs. All condition issues are noted; all items are vintage or antique and usually have signs of use/patina. tracked parcel to the U.S. starts at $14 (other spots may vary) - insurance/tracking included. Items paid with a credit card will be shipped to confirmed addresses only. We do ship internationally. All of our prices are in $US. NOTE: We DO NOT accept PayPal. 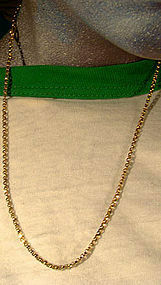 A Victorian 9K rose gold handmade links necklace chain. 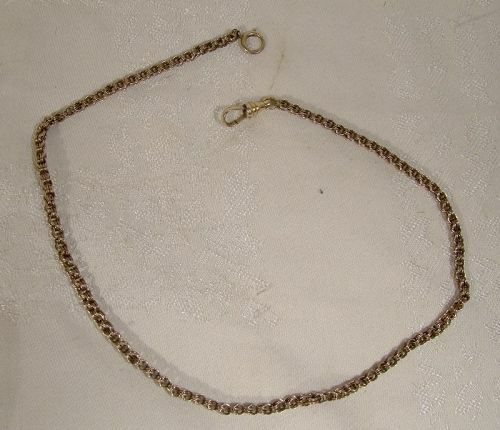 This 19th century 19-3/8" long chain is 1/16" wide, the links have bevelled edges, it has a spring-ring catch, and it has a link which is stamped 9C. This item weighs 4.7 grams, and it is in excellent original condition with no dents, bends, corrosion, losses or damage other than an invisible repair to one link which is firmly attached to the next loop (pictured but not visible). All items are thoroughly and conservatively graded and all condition issues are noted; all items are vintage or antique and may have slight signs of gentle use. Expedited tracked and insured parcel shipping to the U.S. starts at $21 (other spots may vary, air is higher). Items paid with a credit card will be shipped to confirmed addresses only. We do ship internationally. All of our prices are in $US. PLEASE NOTE: We DO NOT accept PayPal.